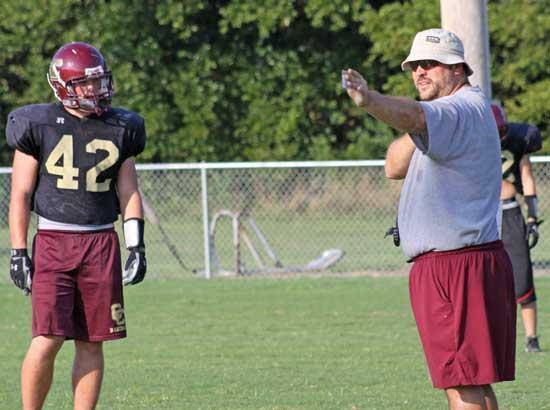 Cannon County Head Coach Joel Schrenk provides instruction to linebacker Gabe Walkup during practice this week. Heath Simons expected to be on the receiving end of aerial passes at the start of the 2010 football season but the Cannon County senior collected his first career start at quarterback when the Lions opened the campaign at Spring Hill last week. Injury to sophomore Brandon James helped precipitate Simons' move from receiver to quarterback but he was already a backup under center and his recent play in scrimmages was allowing him to push for more playing time. Simons believes he is more prepared for the role of quarterback as Cannon County (0-1) prepares for its home opener against West Creek Friday at 7 p.m.
"Things are starting to slow down for me at quarterback," Simons said. "I've been working all summer, behind Brandon, and getting ready. I have a pretty good understanding of what I need to be doing. We just need to have better execution." Simons was 7-of-20 for 75 yards and threw one interception against Spring Hill, but he also was victimized by numerous dropped passes. West Creek will be playing its opener at Cannon County. The Lions won 35-7 last year in Clarksville in the first-ever gridiron game for the newest school in Mongomery County. Cannon County Head Football Coach Joel Schrenk says things could be much different this time around. "West Creek is really good and has a lot of athleticism," Schrenk said. "Last year when we played them it was their first game ever and they had three seniors. Now they have 30 seniors and have played a full year of 5-A football. They are a totally different team this year. We are once again going to have to play our best to have a chance to win." Cannon County's offensive line was a bright spot in the opener at Spring Hill, providing consistent pass protection and an above-average run game. The unit, anchored by Thomas Stone, Daniel Northcutt, Paul Oneel, Jared Melton and Zach Osborne, drew praise for its play at Spring Hill. "Looking back I thought our offensive line play was very good," Schrenk said. "Defensively, we made good reads but we didn't tackle well. We are still working on being better tacklers. We had just one turnover and just a few penalties. Those are good things. If you can do those things, limit your penalties, don't turn the ball over and block people, then you should have a chance to win." Senior Gabe Walkup led Cannon County with 82 tough yards at Spring Hill. Damon Collette was limited on the ground but did haul in two catches for 40 yards before getting banged up and seeing limited action in the second half. Sophomore Justin Tobin led the team with seven tackles, six solo and Simons had five tackles. The problem is Tobin plays corner and Simons safety so too many plays were being made in the defensive backfield. Walkup also had five tackles. Simons was very active defensively with an interception and a deflection.